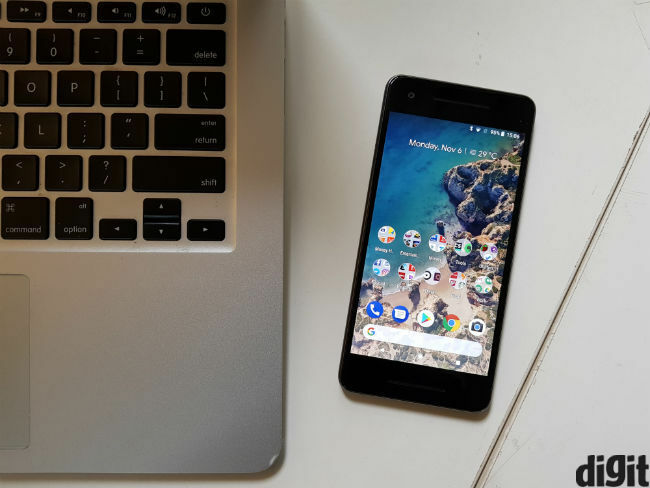 The Google Pixel 2 is the Android phone we’d recommend to anyone who wants a compact Android phone and can afford its huge price tag. It has an excellent camera, but battery life needs some work and Google should put more into its design. Having reviewed the Google Pixel 2 XL, there’s really little I can say about the Pixel 2. 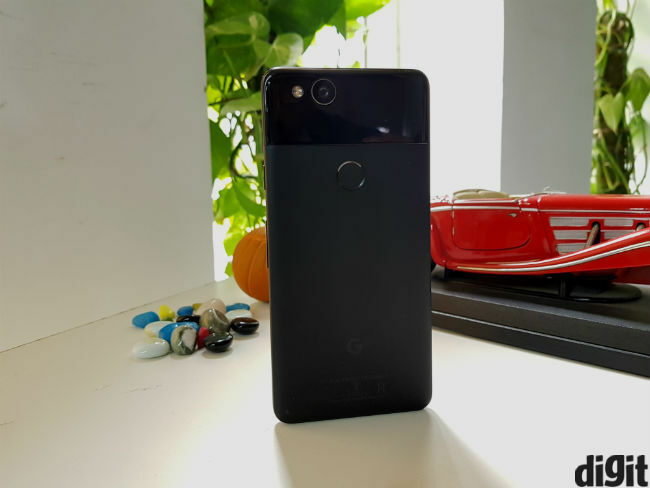 Yes, the smaller variant of Google’s premiere smartphones is a phone that warrants a review for itself. 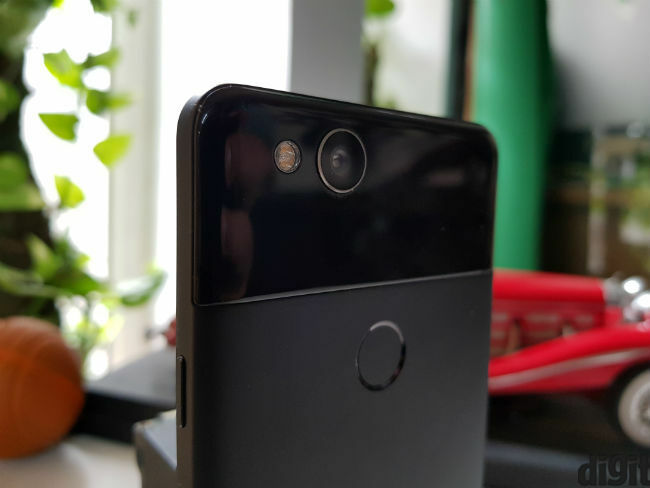 The most important aspect of these devices, including its AI prowess and camera remain the same as the Pixel 2 XL, but the Pixel 2 has a one or two things that make it different. It’s worth noting that our Pixel 2 review is intentionally brief. The entire camera section will be missing, since you can read all about it on the Google Pixel 2 XL review here. In this review we cover only the aspects that differ between the two phones. Of course, the most obvious amongst those is the fact that this phone is smaller. With a 5 inch display, the Pixel 2 is perhaps the most compact and ergonomic phone today. If you like compact phones, you’ll take to this phone right away. 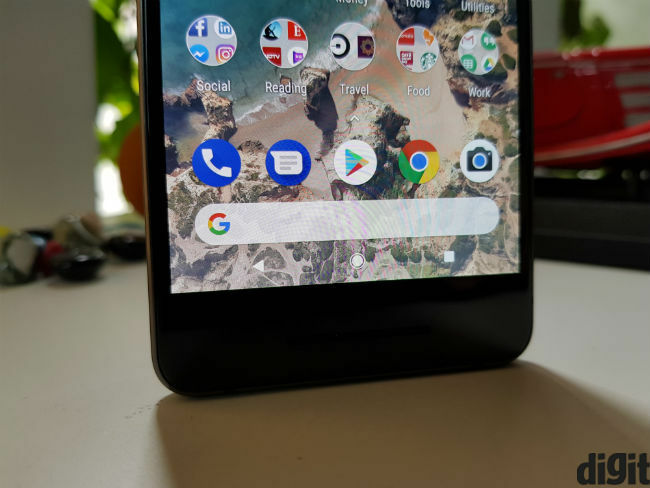 But that said, the Pixel 2 also has huge ugly bezels on either side. No one’s done a 5 inch 18:9 display yet, but I keep wondering whether that would have made this phone better. While the Pixel 2 is meant to be one of 2017’s best Android phone, it certainly doesn’t qualify for that monicker in terms of design. The aluminium frame remains the same as its counterpart, but the Pixel 2’s smaller footprint also makes for a lighter smartphone. It’ll disappear in your pocket when you’re walking around. As with the Pixel 2 XL, I wish the power button and volume rocker were more tactile, though they are easier to reach at this size. To sum up, the Pixel 2 is without a doubt the most powerful compact phone today. But as with all Pixels so far, it brings utilitarian looks, putting functionality over beauty. Next, the display itself makes a big difference here. You could complain about its resolution, but the fact remains that 1080p resolution works absolutely fine on a 5 inch panel. To be honest, the battery benefits from the lower resolution far outweigh the benefits of higher pixel density. This is also an AMOLED panel, so you’ll get the warmer tone that many like. Of course, Google chooses AMOLEDs to provide Daydream support, so the company has also toned down the warmer tones to some extent. That said, I do need to discuss colours on the Pixel 2’s screen a little more. For instance, the phone doesn’t have the Pixel 2 XL’s blue tint from off angles, and there’s been no reported burn-in issues (our review unit hasn’t had any issues either). That said, the Pixel 2’s display is not what you’d call vibrant. It lacks the “pop” that many people like. It also doesn’t have the curved edges of the Pixel 2 XL and 18:9 display, which makes it less immersive. Simply put, you’re looking at a display that works, but doesn’t jump off the page as an attractive display. In terms of power, the Pixel 2 is fitted with the same hardware as the bigger version. 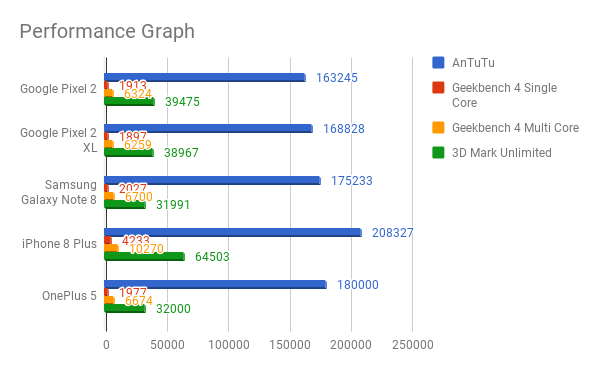 With a smaller screen and lower resolution, that amounts to higher scores on some benchmarks, especially ones counting frame rates. That said, there’s really no real difference in performance here. The Pixel 2 is fast, smooth and it’s a pleasure to use. Want a compact Android phones that’s fast too? This is your best bet. Note: The high pitched clicking noises from the Pixel 2’s speakers, reported by some users, were not heard on our review unit. NFC was kept on throughout the review period. The issue though has been acknowledged by Google, and the company said turning off NFC is a temporary fix. An update is on the way to fix this issue. A smaller form factor comes with a smaller battery. However, the 2700 mAh battery on the Pixel 2 lasts me just as long as the XL version. Leaving home with 100% battery at 10am, I found myself charging the phone between 4.30 and 5 pm every day. On a daily basis, I could play Sim City BuildIt for about 4.5 hours at a time. So, while you will get by a work day with this device, you’re looking at two charges per day. Like the Pixel 2 XL, that makes for average battery life. I wasn’t particularly happy with the Pixel 2 XL, but I do like the Pixel 2. That’s partly because I’m a sucker for compact smartphones though. We must commend Google on keeping the essentials unchanged between the Pixel 2 and Pixel 2 XL (make note, Apple!). 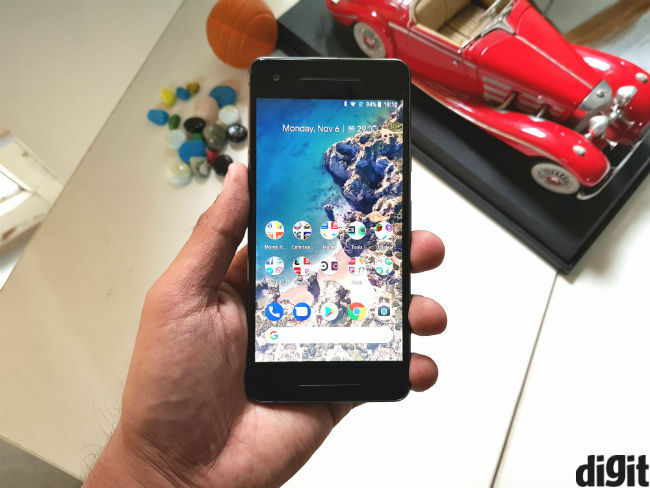 The Pixel 2 is the Android flagship for anyone that likes compact phones. Of course, you also great the excellent camera to go with that. If I had to recommend one of the new Pixels, I’d pick this one without a doubt.